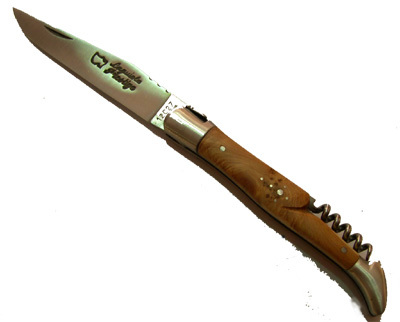 Laguiole of the registred trademark "AU SABOT"a cutlery established in 1870 in the city of Thiers . 17 cm Laguiole knife with a stell blade and fork with handle in vitrifided walnuts wood and two brass bolsters. Presented in polished oak chest.